This was great, Patricia–thank you! Marjorie, I’m so glad you found it helpful. Thanks for the feedback! Yes, to live the playground bully as a part of ourselves. Vic, yes. It is so easy and tempting, isn’t it, to externalize and blame instead of using the opportunity for our own growth. Thanks for chiming in. What a wonderful perspective! Ego is truly an energy that does turn everything upside-down. I remember in one of the many Wayne Dyer books I read, he said EGO stood for “Edge God Out”…..which has caused me to visualize my EGO as a bully: someone who was so deeply wounded that s/he had to lash out and create scenarios that were built on fear. That fear causes us to then freeze – emotionally & spiritually. Once we realize this bully is just a deeply wounded part of ourselves & we shift into a compassionate energy, we begin to restore faith in our inner goodness – or even our inner “Godliness” (aka Divinity). Thank you for contributing Dyer’s insight–and your own. It is so true that the ego responds out of fear, and that in the presence of fear, compassion is the most helpful response. To have compassion for ourselves–for our own fearfulness and ego-driven lashing out–is truly the beginning of transformation. Thank you also for sharing the post on Facebook and helping spread the message. I really appreciate it. Namaste to you as well. I disagree with Marjorie above, but only slightly – Patricia, that was REALLY, REALLY, REALLY GREAT. I always come away with a cache of priceless gems from reading your blog. Thank you, Ed, as always for your great enthusiasm. It is always a delight me. It’s so nice to have such a loyal cheerleader!! I had a similar conversation with a friend just the other night about how Trump is our collective shadow, I see it from above, I see it from below and I see and feel it from the center of my very being. It is my work to pull it all together within myself. There are moments when my own ego kicks in and I take pride in what I think is superior reasoning. Working towards creating a balance between activism, solidarity and opening the space for love and understanding in my own consciousness is an on going process. So thank you for this Dharma teaching. Anna, I so appreciate your frankness about the challenges of disengaging from ego-thinking—even when we know we’re doing it! I couldn’t agree more that this is our work, to bring about this inner integration which will have ripple effects throughout the entire collective dream. Although the political landscape looks grim from one perspective, I see more and more people waking up and stepping up to the sacred task. A friend shared this on FB yesterday. Oh my gosh, thank you so much for it. I’ve been trapped in my mind about Trump and it has been ruining my days. This is the antidote. I’m so glad you wrote it and so glad and grateful that I read it. And thank you to Holly above who points out that our own ego is so frequently a hurt bully. That is such a good teaching for me. Trish, I’m glad it spoke to you. Roger Wolsey, author, Kissing Fish: christianity for people who don’t like christianity. Roger, thanks so much. I took a look at your blog and it’s clear we are on the same page. Reading this on Nov 10th 2016…..it just rings so true! The “people who I imagine will never be able to grasp this”…..are the reflection of my own old belief systems which are still as tunnel visioned as ever! Or are they just my awareness of the mass unconsciousness perhaps? Welcome them into the light…. I have a mischievous notion to wear an I love Donald t-shirt but that would be asking for trouble! I am wearing it in my imagination – to remind myself who he really is! ; ) Love the header image! Marigold, thanks for your comment. I think now more than ever we need to keep reminding ourselves that love is the only way to transform our present nightmare. I have been studying spirituality, metaphysics for some time now ( and still very much a student). I have always been challenged by the conflict of existing (in this lifetime) as an African American woman, a category that sets me up as a very real potential victim of disproportionate scope …to see these powerful beings as being an illusion. Yes potentially I could possibly imitate the darkness that DT represents. But I have far less power/possibility than my brothers and sisters who have white privilege as a function of their skin color, to do so. 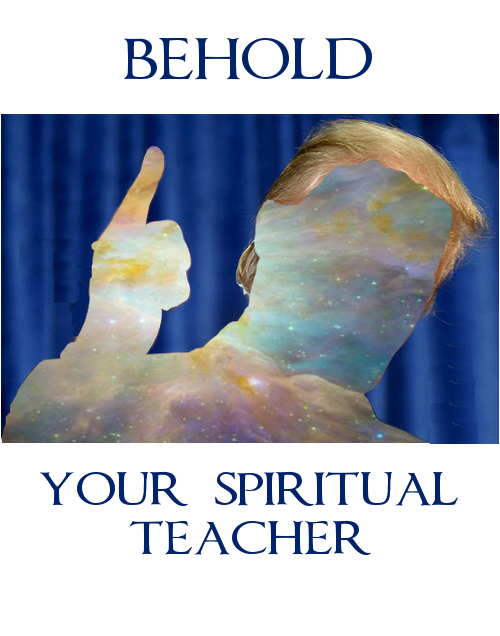 In fact, people of color, having been victims of choice across the globe for centuries , and are even more challenged to see DT types and groups as spiritual teachers, to be embraced. These types have an impact that is very personal , not just philosophical/theoretical. Our children, relatives and friends are more likely to be killed, taken away from this world. We’re probably more likely to see him as a lost child of God who should be loved in spite of what he appears to be. It’s hard to see him as a teacher. Still I very much appreciate the loving world you are showing us. Robyn, I so appreciate your thoughtful response. You are so right, that on this level of existence there is much suffering—and people of color have endured the worst manifestations of our collective ignorance. As a white person (on this plane of existence) I know that if I fail to perceive your suffering as my own, I am asleep in the dream, unaware of my true nature—because outside of our collective illusion you and I are one. That is not a metaphor, but a fact. It is my hope that more and more of us now will embody that fact in very real acts of solidarity. We have had many great leaders who have shown us how this is done—Gandhi and King to name just a couple. Now it is our turn. Thanks again for taking the time to share your perspective. By the way, you might appreciate reading a previous post I wrote about this subject—Three Ways to Be a Peacemaker in a Time of Hatred. Robyn, Thanks for sharing your world with those of us who try to have the insight we need to be truly empathetic. Hearing you voice your reality and you family’s and community’s bring a the reality into better focus. Please keep speaking….we all need this teaching. unfortunately this is not a dream. This is reality. Donald Trump is our PRESIDENT. There is no spiritual lesson here. He is a horrible person who now has his hands on the nuclear codes. I feel no warm fuzzies. Our country is in serious trouble. Take you head out of the sand. There is no lesson here. Hate has prevailed. Joe, I can appreciate your outrage, and I agree with you that our nation is in trouble. We are going to have to come together in ways we never have before—which can be the very thing that turns this story on its head. Hatred has only prevailed if we decide that is has. This story is far from over! As I was reading this post I was screaming inside. No No No ! I feel angry at DT’s win and I feel we need to take revenge !!! But I also know that when something sets me of like this then that is probably an area I need to work on. But you are right about it all ! Even though right now I don’t want it to be. I will look deeper into my soul and I’m sure eventually I will recognise DT for the spiritual teacher that he is. Thanks for this post.Glad I stumled on this blog. I will keep following it. I love your honesty and your capacity for self-reflection. It’s so true that the ego rails against having a mirror held up to it, protesting that we must hold onto the idea of enemies at all costs!! The only problem is that it gets us nowhere except where we started: divisions, violence, hatred. Personally I think we can do better. Indeed, I have faith that we will. Glad you found your way here. Welcome! Share, care and love the people around us, wich are in need of our support. Pick up the example of the great spirits of our world which invested their lives selflessly in the service of mankind. Remember, if history teaches us one thing: Evolution happens only if humans work together as a whole, that is our strength which sets us appart. Every time people forgot about this, their cultures vanished from the face the earth. My sentiments exactly, and I really appreciate you pointing out that is our capacity to work together that has gotten humans this far. Now we have the opportunity to bring that strength into full expression and turn this story around! This information that you share is so very grounded in reality and universal law, and I thank you for the help in staying on the high road during this challenging time of growth! Thank you for this illuminating post. I became aware of Trump’s personality a few weeks ago while I undertook a massive research to find out why many of my most loving relationships have ended in tragedy. I have spent lifetime searching for healing yet found none. When finally about a year ago my very caring therapist with whom I had a deep connection suddenly abandoned me my whole life fell apart yet again. But this time I turned to our Source to find the answers. And wow did they come in abundance! Finally I am learning about the personalities such as Trump’s. Before the election he was diagnosed as a malignant narcissist by a psychologist, John Gartner. And so I first learnt that my former therapist is either a narcissist or a psychopath (having only limited exposure to his behavior in sessions I cannot yet determine it precisely). After a massive shock and finding more such people in my life I see how they can become either an absolute nightmare or a blessing in disguise. And although we have the choice which lesson we receive, it depends on much openness and understanding regarding the consciousness of ego. For me, my therapist became the source of extreme pain and destruction yet I also was able to see my own ego’s reflection as he mirrored it to me. We can make the shift from seeing these people as perpetrators and saviors and ourselves as victims only if we step out of ego game entirely. Anything else is only shifting in this triangle roles. So I would like to invite caution when someone is hurting badly to try to see their perpetrator as a spiritual teacher or savior because this is exactly what they want. It could plunge you deeper into despair. Sometimes first we must go through grieving period after the abuse and other healing processes before we can learn from evil. Sometimes we need to move through our own reactions of hostility and hatred first before we can embrace our Oneness in all. This is certainly what I did. First I allowed all the hatred in me to flow through me. Then the insights and new choices appeared, followed by compassion for our wounded ego. Thank you, Kate, for sharing your experiences—painful though they have been—and the wisdom you have come to. I totally agree with you that in the course of healing, one’s authentic feelings have to be honored. It is often only in retrospect that we can understand how we have grown as a result of our adversities. I appreciate you taking the time to write such a thoughtful response, and I wish you all the best. Dear Patricia, thank you for your inspiration! Only today I read it on a German website. A friend of mine always say: “Even I see Trump at TV I see a mask.” Everything has a meaning, also when it sometimes feel difficult. Peace, love and convidence all over the world. Many greetings from Upper Bavaria/Germany. Thank you for sharing your thoughts and those of your friend. It is such a wonderful thing when people from all over the world join in holding a loving vision for our planet. Wonderful piece! You’ve put into words what I’ve been sensing, but didn’t know how to express! Brava and amen!